-	Please read all information above carefully before you apply. Copy of valid passport and last visa page. Copy of degree qualifications and certificates. 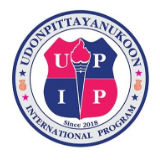 If you want to find more information about our school, please visit our school web site at www.udonpit.ac.th, or contact the email address above. Please feel free to call 093-141-0654 , 081-708-4503 as well.